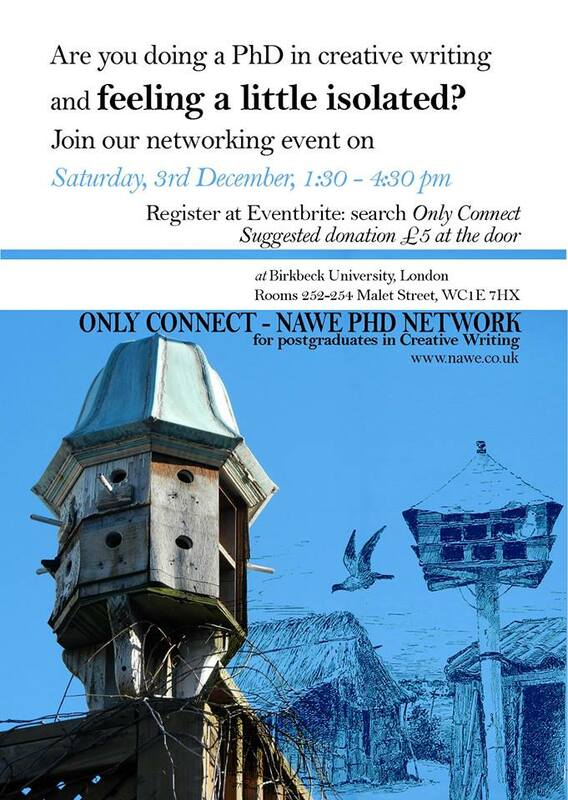 Only connect: NAWE PhD network for postgraduates in Creative Writing held a networking event at Birkbeck last Saturday, 3rd December. The afternoon began with an introduction from Seraphima Kennedy, Programme Director for NAWE, who gave a brief overview of how Only Connect started last year. Seraphima also gave an outline of the afternoon events including thinking about what you want your future career post-PhD to look like. Lily Dunn then spoke about juggling teaching, the creative and the critical, publishing your work and what is expected of us as an academic educating ourselves and getting the best out of ourselves with each other by networking. We did a quick introduction to our neighbors, mine was Anne Caldwell, an experienced lecturer, poet and creative writing coach, who used to work for NAWE. We had to talk about a problem with our PhD’s, a success, and a question about our research. The time went so quickly I just about managed to mention one of my successes, a recent conference at Oxford University. One of the problems that came up time and again throughout the afternoon was switching between a creative and critical head, and our relationship with supervisors especially those that seem to want a critical piece that is almost entirely separate from the creative. There was also the family/friends/work difficulties, coping with those and especially if there was a crisis. It was suggested researchers look at the NAWE PhD benchmark and to ask supervisors for a descriptor of the PhD – the course outline/requirements. Senior Lecturer at Birkbeck, Julia Bell spoke about building a career with a PhD in Creative Writing and how to get the most out of it, say for example by publishing or taking every teaching opportunity available, as well as administration, research, funding, and one’s own writing practice. Don’t rely on the university for teaching, she said, there are other ways to get experience, for example community teaching, adult education in particular – beginners courses not covered by colleges anymore. Julia also suggested that if all the aspects of doing a PhD were daunting, if you had difficulties fitting it all in, then go to a time management class. Be organised, she said, and it was crucial to protect your time, and to be able to say you were not available at least one day a week. We were reminded we have free access to JSTOR, a digital library of academic journals, books, and primary sources. Julia also recommended we look up The Program Era by Mark McGurl, which looks at the effect creative writing had on the pedagogy of English. Explore the corridors of your university, find other departments and talk to other academics about what you do. You may want to do this by attending a talk in town/university or simply just going to listen to authors talk about their books. Or networking with potential future colleagues. Julia finished by saying: ‘Life of the mind is a luxury, pay attention and use it wisely’. Southampton English department runs Writers in Conversation and you can see past videos here. There was talk of the Shared Futures Conference that is taking place in Newcastle in 2017. This will be a huge gathering of 450 academics discussing the future of English studies. NAWE will be represented and taking part in that conversation. Coincidentally so will I. I will be taking part in a roundtable with Stephanie Butler, Prof. Helen Berry and Dr. Helen Limon, so I’ll be able to put into practice some of the very useful advice from Saturday’s event. Like Lily Dunn and Zoe Gilbert who spoke about how the London Lit Lab was set up. They had been offering classes for free but decided it was time to earn at least a small amount. They spoke of how they saved costs by designing their own website, a friend offered them space in a café, and how they advertised themselves. Offering non-celebratory courses at a price beginners and writers with experience could afford. They also spoke of how teaching together meant they could support each other. They describe themselves as London’s friendliest creative writing courses. We then heard about creating opportunities from Frances Gilbert, who teaches at Goldsmiths on the newly named MA in Creative Writing and Education, which also happens to be the subject of his PhD. He simply said, ‘Do something else’. Departments, are usually quite separate, though there is a move towards interdisciplinary study, ‘reaching out’ is a good option. He also suggested a way of getting funding for research could be to look at widening participation and finding the right partners. He uses mindfulness with children in schools and has had some fantastic results, not only creating peace in the classroom but also initiating change in children’s lives. We’re living in a ‘technocratic’ time, where creativity needs to be explored. The big idea of the afternoon was collaboration. Jocelyn Page who has a PhD in poetry said this includes something as simple as looking at past PhD’s in other universities. And what journals we could be publishing in. There is a grading for journals, that though, is something that is still not clear to me. Jocelyn gave us some tips for the VIVA such as having a crib sheet in case the mind goes blank. And she spoke of another hot topic of the day, ‘academic language’ and finding your own voice in academia. One way of doing this was to find a book that is written in the tone that you can achieve. Finding the right language to express what you are doing in a conversational/natural way. Keith Jarrett echoed the sentiment by saying that trying to explain what you are doing as a Creative Writer is often difficult. His PhD looks at how religious cultures are changing over time, an interdisciplinary subject with feet in Religion at SOAS and CW at Birkbeck. He said that for him it was all about maximising both sites. The final activity of the afternoon meant looking at the content of the PhD, the research, and how this fitted in with our own interests. I discussed my ideas with Anne Caldwell and from this she asked me a very interesting question: Am I interested in the care leaver writer or the representation of the care leaver? Both! But the question made me think about what I’ve done so far and how I just know the research is still too broad and how I will have to eventually narrow down my interests. The final tips for the day included knowing ones priorities and being aware, for example of the exploding PhD. I feel I may be about to light the taper on this one. Apparently we’re not to panic, it’s normal, and we must just smooth it back into shape and don’t be scared – just “keep writing”. This entry was posted in Blog, PhD and tagged administration, Birkbeck, conference, Creative Writing, education, funding, interdisciplinary, networking, PhD, postgraduate, research, teaching, writing practice. Bookmark the permalink. Thank you, I’m glad you find it interesting.